Carte du Bourdelois du pais de Medoc et de la prevoste de Born. 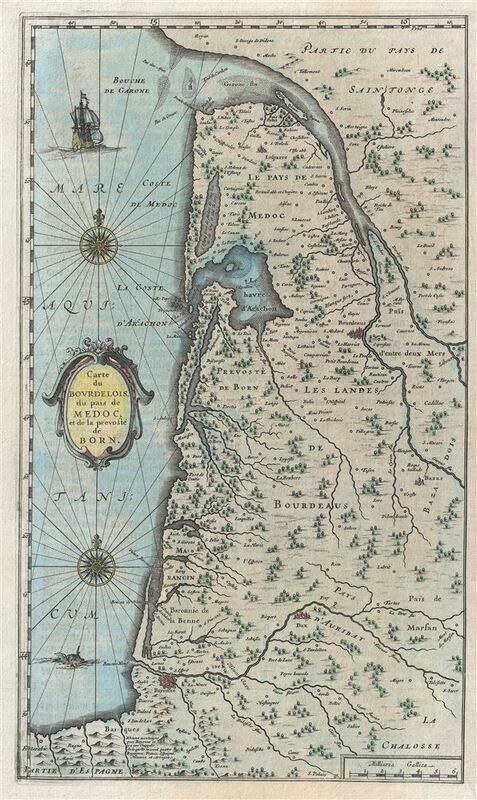 An attractive c. 1667 Blaeu map of Bordeax and the Pays de Medoc, France. Covers the modern day Department of Gironde from the Garonne River to Spain and from the Atlantic to Mont-de-Marsan. This coastal department is the seat of the Bordeaux wine region and produces many of the world's finest red wines. Shows numerous vineyards and chateaux. Printed for the German edition of Joan Blaeu's Atlas Major. Blaeu, W., Atlas Major, (Amsterdam) German Edition, 1667. Good. German text on verso.